We are celebrating Our Daily Bread Designs 7th year anniversary this week! HAPPY ANNIVERSARY ODBD! Today we start off with our first blog hop! 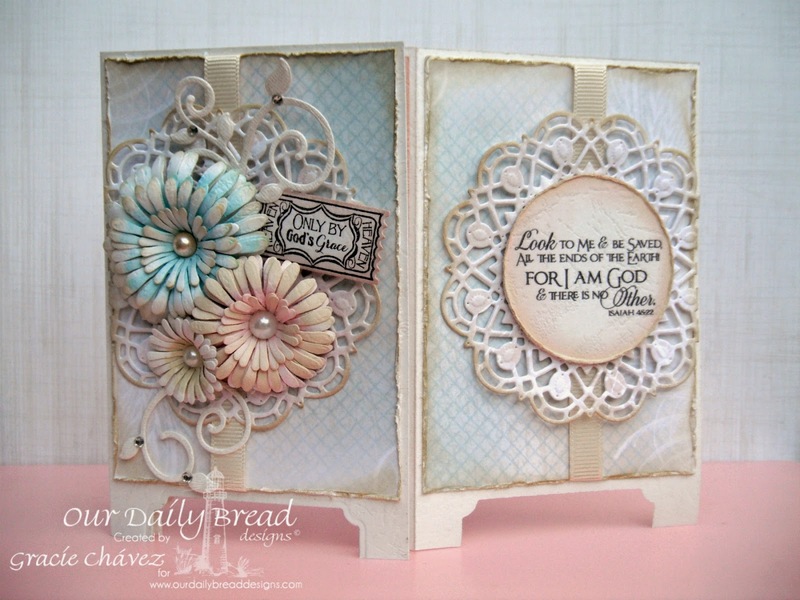 The design team has created beautiful samples inspired in ODBD’s Scripture Collection stamp sets! I created a folding screen (accordion) card using a verse from Scripture Collection 11. 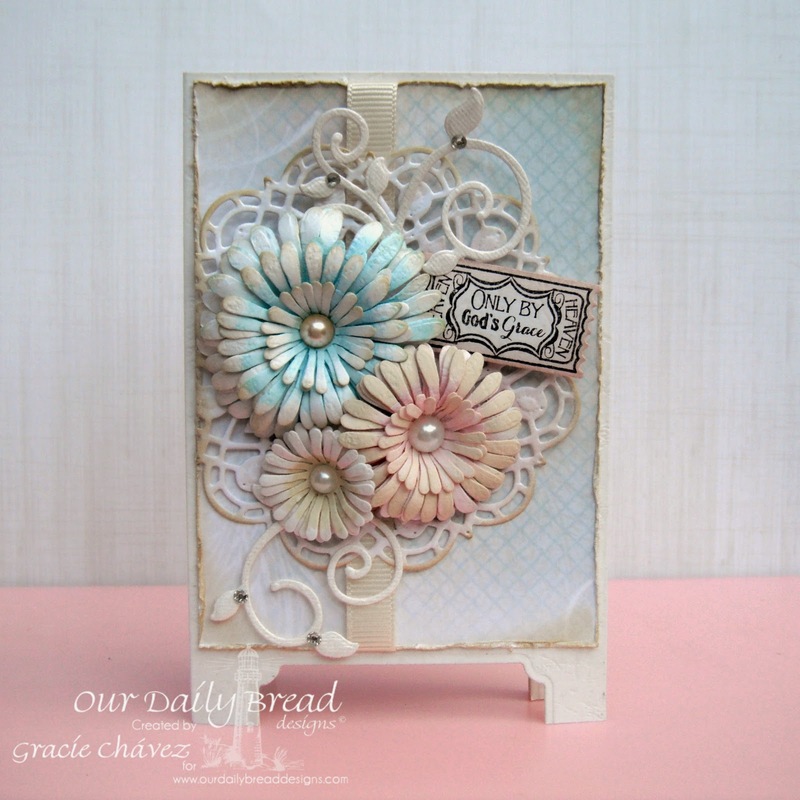 I used ODBD stamps, dies and papers to create this shabby chic card. I made some flowers inked softly with sprays, added pretty die cuts and a few delicate pearls and rhinestones. This card measures 5 1/2″ by 3 1/2″ closed and 5 1/2″ by 10 1/2″ opened. 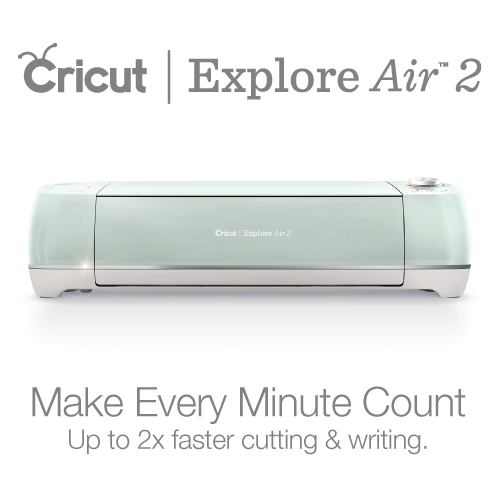 It fits an A2 envelope perfectly but once opened it stands on it’s own and looks very delicate and elegant. I chose this verse because I find that it contains a very important truth for the modern church and the global society. More and more people are being overwhelmed with information and situations that defy their faith in God. It’s important to remember that the truths written in the Bible are universal truths that will never fail to those who follow them. He is God and there is no other. Our Daily Bread Designs lets us share the word of God through encouraging Christian stamp sets. 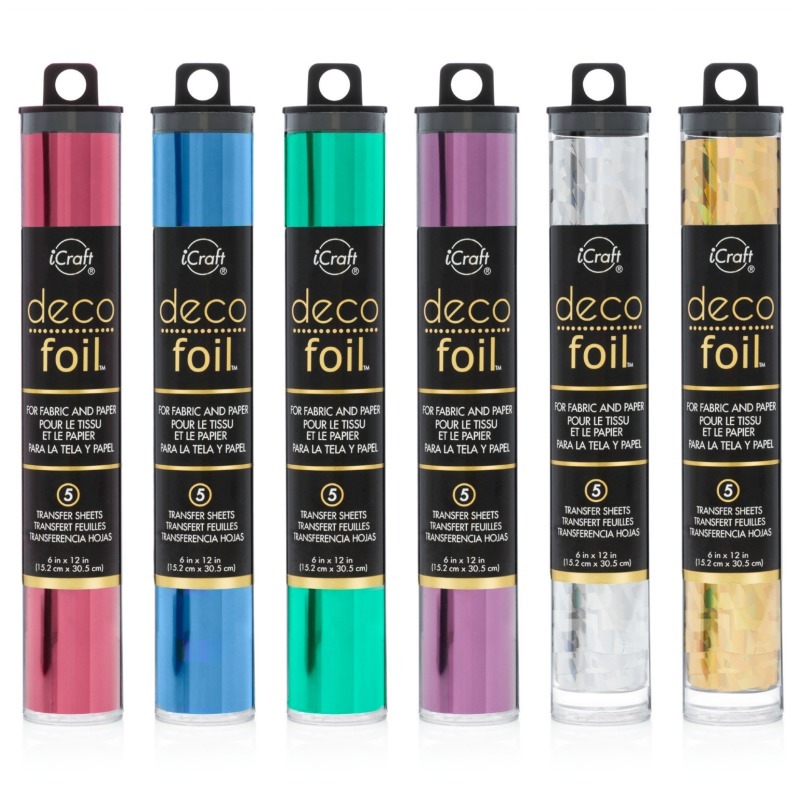 This company has blessed us with it’s products for 7 years now! Wow! I hope you can join me and my DT sisters as we celebrate this anniversary! We would love to have you join us in sharing your projects using an ODBD Scripture. 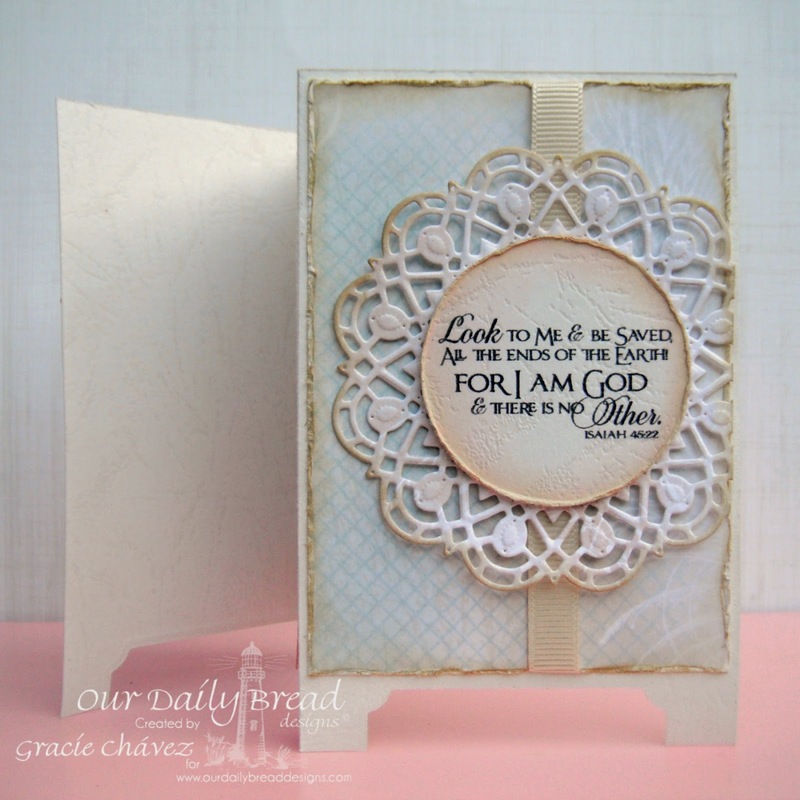 Whether it be cards with fun folds, CAS, cards using techniques, scrapbook pages or home decor items, we would love to see the projects you create using ODBD Scripture stamps. To enter, simply create your project using an ODBD Scripture, then add your permalink to the InLinkz found at the bottom of the post found HERE by Saturday, March 21, 2015. Seven random winners will be chosen from all entries to receive a $15 ODBD Gift Certificate to the ODBD store, to be used toward the purchase of ODBD stamps found in the “stamps column” of the website. Winners will be posted on the ODBD blog on Sunday, March 22, 2015, so please be sure to check there to see if you have won. Thanks so much for your visit! Have a great week and don’t forget to stop by on Tuesday for yet another blog hop and more prizes! Gorgeous card with such a beautiful message!!! Our Lord is the only one who can straighten things out…..we must cling to Him and His word!!! I love the accordion design…..so clever, and your sculpted flowers look amazing!!!!! Fabulous job!! HUGS!! I love your scene card Gracie!! Such beautiful colors and your flowers are gorgeous! Love the “Only by God's grace” isn't that so true for all of us and your scripture is marvelous! Love the distressed edges as well! Just beautiful my sweet friend!! What a stunning and creative design my friend!! I just love all the different panels, your gorgeous flowers, and your layout with the beautiful scripture!! 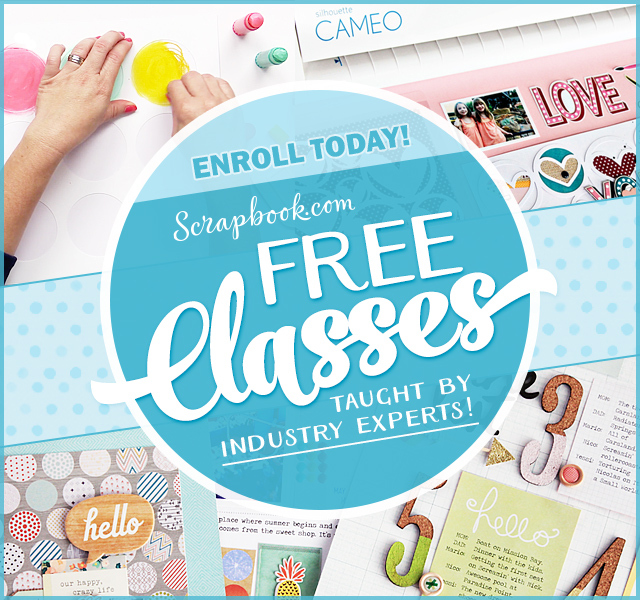 Love your trifold chalkboard design!! Gorgeous Gracie!! Oh goodness Gracie!!!! Your accordian screen design is over the top beautiful!!! I love the softness of the colors, the delicate details, the various panels are so pretty and full of shabby goodness….and I love the Scripture! Soooo glad you've brought your incredible talent to ODBD!!! You always inspire me!!! Gorgeous card Gracie! I love how your flowers turned out. Wow, your projects never fail to inspire Gracie! This is a a lovely card with a lovely card with a truly great sentiment. WOW….what a beauty! Love the shabby chic…. Gracie, you have the coolest ideas! This card is just gorgeous…love this design! This is absolutely stunning Gracie! Such beautiful design to showcase God's Word. Oh, Gracie, this is gorgeous! And I really love the card fold you've used with the beautiful colors and embellishments!! And, yes, it's a very special verse, and I agree about your comment about the modern church and our society! Thanks for sharing this beautiful card and the verse!! Hugs, sweet friend! So pretty Gracie! Love the soft colors and amazing embellies! What a fabulous verse as well! Thanks for sharing! WOW, Gracie…love your folding screen card! Each panel is gorgeous! Love your use of the doily and the floral arrangements are just stunning! Beautiful vintage design, my friend! Hugs! My oh my…Gracie, this is just beautiful!!! Beautiful verse too! What a treasure should someone get this in the mail! Gorgeous card Gracie! So beautiful! I love the shabby design – everything is just so pretty! Awesome scripture that you chose too! so pretty, just love the shabby chic feeling they have! Gracie, this absolutely took my breath away! The artwork is tremendous and I love the use of the Scripture and tag. The design is great! Thank you, too, for your views on the statement on the need for knowledge of God's “universal truth.” I totally agree. Gracie, I love how you created this card. It is gorgeous.